Selectfluor® is a registered trademark of Air Products and Chemicals, Inc. for the fluorinating reagent 1-Chloromethyl-4-fluoro-1,4-diazoniabicyclo[2.2.2]octane bis(tetrafluoroborate). 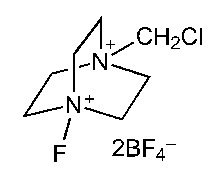 The Selectfluor® reagent family consists of two N-F type electrophilic fluorinating compounds, Selectfluor® reagent presented here and Selectfluor® II(1-Fluoro-4-methyl-1,4 diazoniabicyclo[2.2.2]octanebis(tetrafluoroborate)), for use in pharmaceuticals and agrochemicals. Both are versatile, safe and easy-to-use reagents that fluorinate specific positions in complex molecules. Selectfluor® reagents rapidly fluorinate a broad range of organic molecules under mild conditions with high efficiency and selectivity. In many cases, Selectfluor reagents can replace toxic or explosive fluorinating reagents such as FClO3 or CF3OF. They offer a convenient and less complicated alternative to fluorination processes.